If you ever opened up a computer tower, you know that there are many different size screws. You also may realize that some screws aren’t even imperial or English, which is what we use in USA. Same situation outside a computer. A video cable such as VGA or DVI for instance, usually has two screws on the connectors so you can screw the end to your computer. What happens if you use an extension cable? You get screws on both the regular cable and extension cable, hardly any use when both sides are screws. I recently had to extend a VGA cable and was faced with this nonsense. The connectors on the regular cable and extension cable will easily get loose unless I tape them together. So I started looking for standoffs that can bridge two screws together. It turns out that these screws aren’t imperial either. They are M3! Good thing I grabbed a few M3 standoffs with threads on both sides so I just used two of those. Next time you want a perfectly secure extension cable, look for M3 standoffs. The bronze standoffs are in between two VGA connectors, both of which feature screws. I recently got a request to add bidirectional transceivers to my SDI-12 USB adapters to handle very long SDI-12 bus wires (result of long wires for each sensor and a large number of sensors). Currently a couple of these adapters are being tested by one customer who requested this feature but I am pretty confident with its functions and will conduct my own testing with long wires. If this is what you have in mind, I have a handful of them I’ve built as prototypes. You can go ahead and purchase a regular SDI-12 USB adapter and request one with a transceiver. I don’t have a lot of them so I can only send you one or two. If you really need more of these, I’ll need to order boards and components. The added transceiver will not affect any program code such as my Python data logging script. It is operated transparently. When the adapter receives a complete SDI-12 command, it will turn on the transceiver and transmit the command to the SDI-12 bus. Once done with transmission, it turns the transceiver off and returns to listening mode. The transceiver in the following photo is located just to the left of the top-right 3-pole terminal block (small black rectangle with 6 pins). Additionally, I have received several requests to use my USB adapter as a TTL/serial adapter, such as connecting to arduino or MicroPython boards, either at 5V or 3.3V. I’ve updated my board design to make those requests easier to fulfill. This option is now added to inmojo marketplace as well as to Tindie marketplace (options used to cost $2.5 and now is free). First, if you purchase a TTL/serial only adapter, you will not get USB connection anymore (notice the missing long black chip to the right of the empty USB connector pattern). You can’t really have both active simultaneously since there is only one TTL/serial port on the processor. It’s either connected to the breakout pins for TTL/serial use, or connected to the USB chip to communicate to PC/raspberry pi. The use cases of USB vs. TTL/serial also don’t overlap. 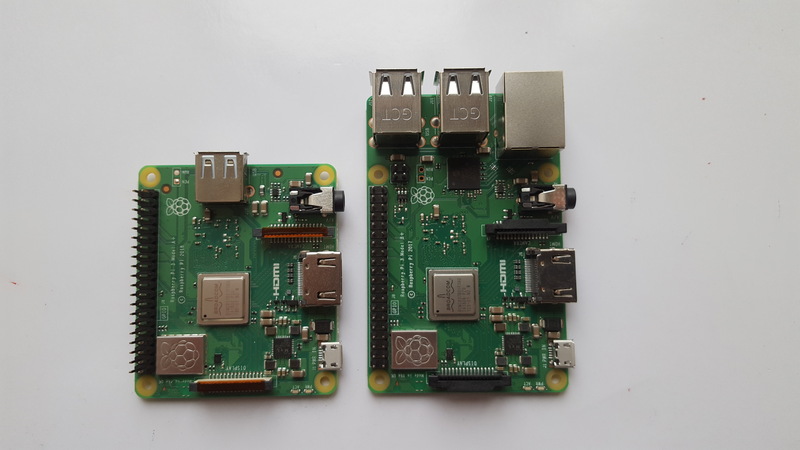 One is for those who want to use PC or raspberry pi to log data, and another who want to use MicroPython boards or Arduino boards to log data. What you will get is a 6-pin connector on the bottom of the board, at 90 degrees so it’s not pointing straight down, rather sideways. See how the wires are under the board, running along the board and the next photo for the underside. 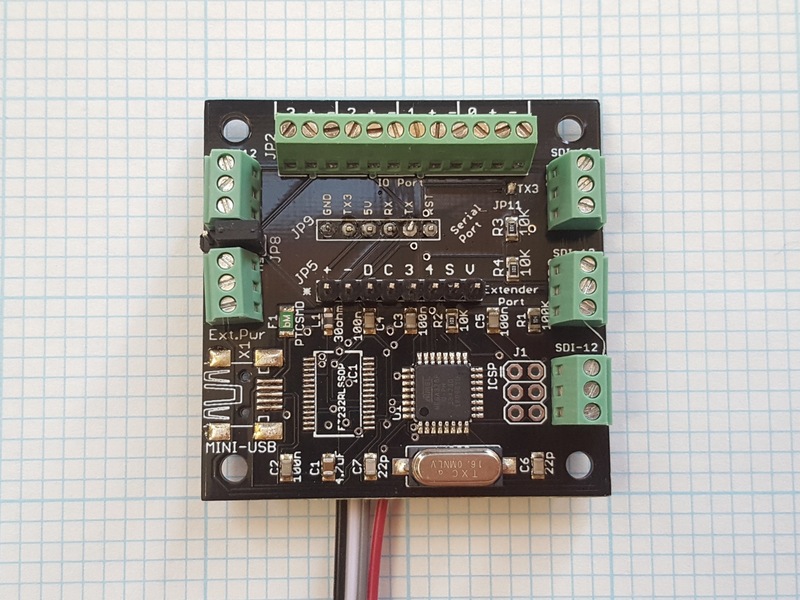 This makes it possible to stack expansion boards or have optional analog/digital input headers (12-pole block on top edge). You still need a 5V supply even if you want a 3.3V TTL/serial interface. The following photo shows a 3.3V version. 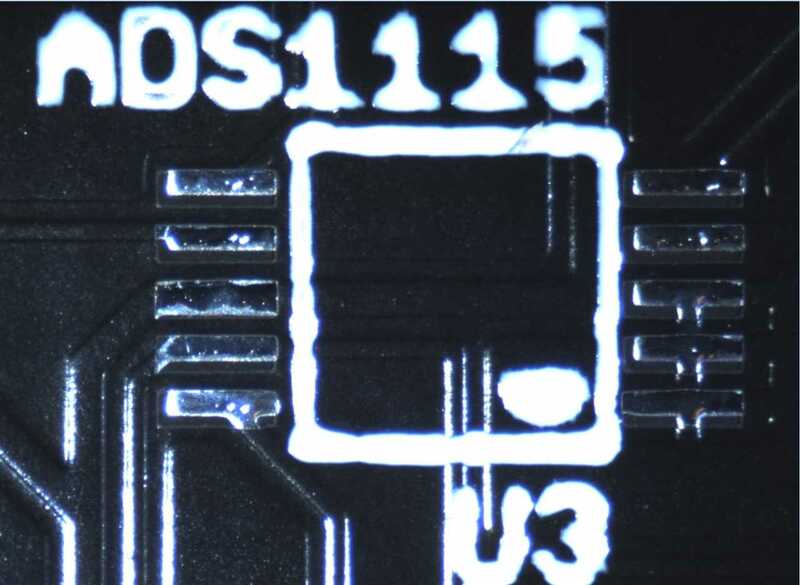 Note the solder blob on the top right to the immediate left of the text “TX3”. Then the TX3 on the serial port (marked JP9 on left and Serial Port on right) is outputting 3.3V logic. 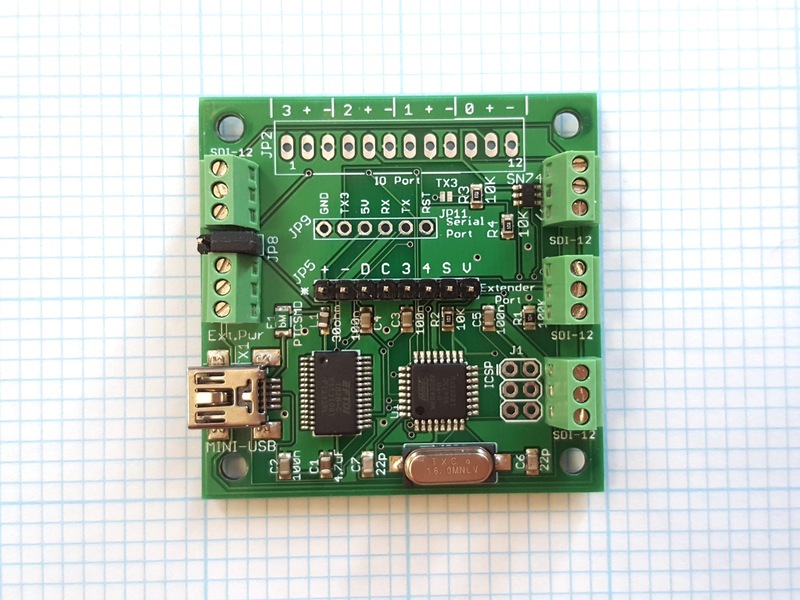 Remember that the adapter’s TX or TX3 should be connected to your other board’s RX pin since the adapter’s transmit (T) goes to your other board’s receive (R). In a previous post, I explained the most recent model of raspberry pi board, the 3B+ board, and my take on why you want a raspberry pi. This post is about comparing the different models. 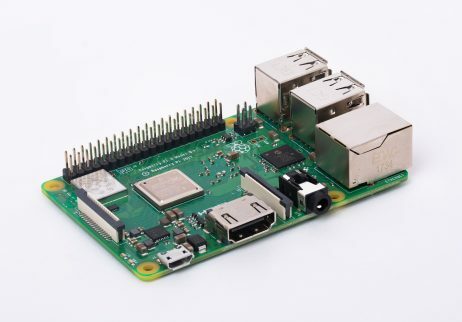 Again, if you are taking on the raspberry pi hobby, get the 3B+ with quad-core 1.4GHz processor, 1GB memory, and most recent Wi-Fi/Bluetooth on board. It’s easy and fun to use. Other boards are made for specific reasons or tasks. How do these boards compare? 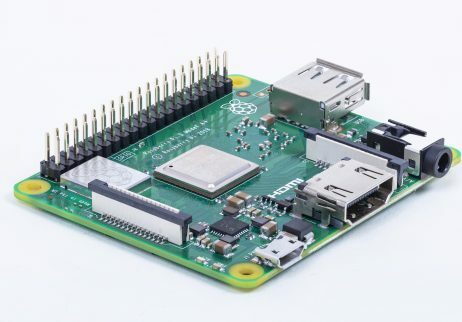 There are three models of raspberry pi boards at the time of this post A, B, and Zero. Please don’t attempt to buy the Compute modules. They are out of the general discussion and only are relevant to circuit designers with enough skill levels to integrate into their products. Originally there were only two models, the model A, the cheaper with less features and the model B, the full-feature one. There are three generations of them already, gen 1, 2, and 3. Major improvements were made between generations, such as doubling memory and using a quad-core in gen 2 or adding wifi/BT in gen 3. When they make smaller improvements to their designs, such as using a faster processor or better Wi-Fi module, they will put a “+” after the model, such as 3B is superseded by 3B+ with faster processor, faster ethernet, more recent Wi-Fi and Bluetooth connectivity, and more power-hungry than ever. The model B boards are the main stream boards. The model A boards have less memory, single USB port and no Ethernet, and at times not offered to contrast every model B offering. They have always kept the $35 price tag for B and less for A, such as $20 or $25. The intent of model A is to have it run a project that doesn’t need all the USB ports or Ethernet. Say you want to run some slides on a big screen, you don’t really need more than just the processor and sd card. USB ports or Ethernet are optional. You can save money with model A. Last time I visited Minnesota Institute of Art, I took a peak behind their big screens. They were mostly using model B (probably gen 2 or gen 3, not the plus with metal heat sinks)! I couldn’t take a photo or investigate more though. It’s an art museum any. People go there to see art, not raspberry pi?! Anyway, that would be a use case for model A. Now (in 2015) the raspberry pi folks wanted to challenge themselves to come up with a computer as cheap as $5 (again accessories count as extra), possibly because many other folks started spinning their own boards with similar specs to raspberry pi and many advertised for low prices. So they did it with model Zero, cramming all that raspberry pi goodness on a board only a third the size of a regular pi. Apparently it is not a prequel to gen 1. They slapped the same processor their gen 1 was using and did away with USB or Ethernet, resulting in a much smaller (only on the look) board that they are selling for $5. Is it really that cheap? I’ll never know. They only sell you limited quantities, such as 1 per customer. Apparently their successfully answered the challenge to themselves and the community was clamoring about it. They designed a sequel, the Zero-W, with a Wi-Fi/BT on board, same as the Wi-F-/BT on their 3B+, for $10 each. This is better than the Zero, since you can’t really interact with the Zero easily. You first need a mini-HDMI to HDMI adapter to bring out the video. Then you need a USB-otg adapter to hook up a keyboard/mouse combo. If you have the Zero, you have no network! You can install nothing or update nothing. You need to get a USB hub and a USB-Ethernet dongle, for another $10 or more. This newer model is again on limited stock. You can buy more than one if you wish to pay a premium of $15 each, or $20 each if you wish to get more than half a dozen. Definitely these Zero models are NOT for any practical projects that need to be deployed at more than a few locations. If you wish to use a raspberry pi as a desktop computer, definitely go with 3B+. 1A and 1B are both obsolete, having single-core sub GHz processors. My oldest raspberry pi is a 1B. It’s painfully slow as a general-purpose computer. I was disappointed at it since the original goal of this device is to teach kids computing. The two mounting holes that were haphazardly placed on the board like an afterthought also bothered me. I did a few projects on it. But nowadays it is sitting idling in its case, inside my box of raspberry pi stuff. In 2014, they cleaned up the board and pushed out 1B+. It’s much easier on the look, and to use, since it comes with 4 USB ports and 4 symmetric mounting holes. This footprint has become the standard for the rest of their models A and B boards. The mounting holes and connectors would be at the same location across multiple generations, and they don’t plan to change. Same processor is used on the model Zero series so far, with a single-core processor now overclocked to 1GHz and 512 MB ram. I do use one of them, the one without Wi-Fi, as a data logger. I had to tether all the wires, USB-otg, to a USB hub, then a USB-Ethernet dongle and a sensor on USB. But since it’s sitting in my garage headless (no keyboard or monitor), I don’t need HDMI or keyboards. I could use the Zero W but still have to have the same stuff due to the sensor on a USB port. Gen 2 only has 2B, no 2A. It’s obsolete as well although you can still buy them. They are better in desktop performance already but would require Wi-Fi dongle to connect to home network. I used to tether my 2B to an Ethernet port on my home Wi-Fi router. Now it’s sitting inside another box with a preloaded program that I might run as a demo. 3B gives you pretty decent desktop performance, comparable to a netbook with Atom processors. I got a retropie running on it, emulating old video game consoles. It has no problem running those emulations. The 3B+ is pretty nice. I use it when I need to get some work done on it. I now have a 3A+, which sports the same processor as the 3B+, with half the memory. It runs fine. I just want one for my small collection and in case I need it for something (probably never, other than blogging about it). There are some projects that you need the smaller footprints and you don’t mind soldering/desoldering, you go with ZeroW. Performance is low, as space is premium for your project. You can add more USB ports with custom extension boards but the size and price both go up. You can connect a camera to it too. If you rely on adapter wires to get to the USB port for instance, then your project size will likely double due to the difficulty of bending that adapter to fit in place. Trust me, trying to organize cables with “huge” connectors such as Micro-USB is no fun. If your project is not limited by size as much, but doesn’t benefit from having more than one USB port, such as a big TV slide show/display case/kiosk, and you potentially want to deploy a number of them, go with model A (3A+). You don’t need the added USB port, Ethernet, or double memory for those tasks. If you want more flexibility for your project, go with the model B (3B+). You won’t be disappointed. There is a chance you can trim down the requirements into 3A+ in case you deploy your project in many locations. This post is intended for those that are considering starting their journeys with raspberry pis or just want to know a bit more about what raspberry pi boards offer which features. If you are a raspberry pi history buff, or raspberry pi advocate (me too but for different reasons than yours), read on as well. Leave me some comments! Not only are specifications of raspberry pi board explained, but also my take on the question “why you want a raspberry pi”. If you wish to know more about the differences between different raspberry pi boards, read my next post. The raspberry pi folks have released another version of raspberry pi, this time, the 3A+ version. I grabbed one right away when my local electronics store got these boards in stock. While I was browsing accessories (believe me you can never have enough raspberry pi accessories), trying to find the official white/raspberry 2-color case, I overhead a couple of people talking about raspberry pi. They were just reading off the labels and that was already confusing enough for them, 3B, 3A+, 3B+, zero-W etc. I know from their voices that they were not being sarcastic, just genuinely confused what’s what. They walked away before I could strike a conversation with them. I thought, if you are just starting with raspberry pi, then what are all these designations and more importantly which board should you get? The second question is simple, beginners should get the best model, the 3B+ model with the fastest processor + most memory + most USB ports etc. The prices only differ as little as $10. The cheaper ones are meant for more specific applications. 4 USB 2.0 ports: minimally you need a keyboard-mouse combo dongle, maybe a flash drive and other devices such as a gamepad, or Arduino etc. CSI camera port for connecting a Raspberry Pi camera: this connects to a camera with special interface for future projects. The camera, which is a $25 separate official accessory, comes with no enclosure or mount. You need an enclosure or separate stand to make it useful. It is also a nice thing since you can make your own design where the camera goes on your own enclosure. DSI display port for connecting a Raspberry Pi touchscreen display: this connects to an official display with special interface for future projects. The display is rather expensive at $60 and needs some assembly. Again it comes without a stand, just the display and an exposed driver board. You need to buy a stand or make your own so the pro of flexibility and con of not a complete solution. 4-pole stereo output and composite video port: probably not useful for most people and projects unless you want your old TVs for display. Micro SD port for loading your operating system and storing data: you need a MicroSD card at least 16GB since raspberry pi has no storage, costing you extra $10. 5V/2.5A DC power input: this is just a MicroUSB socket. You need a USB-to-Micro USB cable (aka Android charging cable) and a phone charger. The required power is rather high so you can’t use your old Android phone charger. I have a couple of generic AmazonBasics chargers with 2A current. Make sure you get a short fast charging cable with thick conductors. Those generic Micro-USB cables have very thin wires that drop too much voltage on themselves so what they deliver to your raspberry pi is often insufficient, causing all sorts of problems. Power-over-Ethernet (PoE) support (requires separate PoE HAT): probably not a beginner’s feature. With the official accessory (a HAT), you can deliver both internet and power through a single CAT-6 cable to your raspberry pi, de-cluttering cables by a great degree. The accessory is “expensive” considering it is $20 extra dollars just to get rid off the Micro-USB charging cable. That’s not the end of it. The other side of the CAT-6 cable, the router, needs to support PoE and has PoE injector. The HAT also covers all your 40-pin headers, so no more tinkering with electronics. This isn’t everything. If you don’t have a monitor, that’s extra $$$. So the minimal equipment cost is $35. A realistic cost is maybe $75. If you want to set up everything from scratch, it’s $100 plus whatever the cost of a monitor. By this time, you should realize that buying a raspberry pi is not going to save you much money from buying a new PC. A PC laptop with the same if not better spec can be bought for less than $200. You can take said laptop anywhere you want and use it for hours between charges. Raspberry pi can’t do any of that! There are kits you can buy and assemble yourself to make a raspberry pi into a clumsy laptop if you wish to dish out $300+. So apparently a raspberry pi is NOT a cheap PC replacement! You will NOT save money buy purchasing a raspberry pi! Should you still get it? If you’re deciding between a cheap computer for school and rent, you should just go with a cheap computer. If you have $100 extra money you saved up for “new cool tech things”, you should buy a raspberry pi. That’s right! Raspberry pi is a HOBBY! I don’t remember having hobbies when I was poor. That’s OK. Unless you’re really struggling to support a family, you can find money for this one hobby. Raspberry pi is not an expensive hobby. If you are interested in technology, this hobby will pay you back in many ways that exceed your already-moderate and low-risk investment. Delay that “smart phone” upgrade! All of a sudden, you have extra money! Make yourself sandwiches or some real food, use a few coupons at supermarkets, bring fruit and soda to work/school, come early and find free on-street parking. In case you wish to integrate the SDI-12 USB adapter into your existing Python script, here I provide a simple script to demonstrate how to get data. You can also use this script as a spring board to establish serial port communication in Python for anything else, such as talking to Arduino. This script demonstrates how to integrate SDI-12 sensors into your existing Python data logging system by providing the minimal necessary features. It MUST run with a single sensor on the bus. For full-featured logging script, download the Data Logger script. I’ll keep this script together with all my other scripts and provide updates to it when necessary. I’m also considering writing simple scripts for other programming languages. 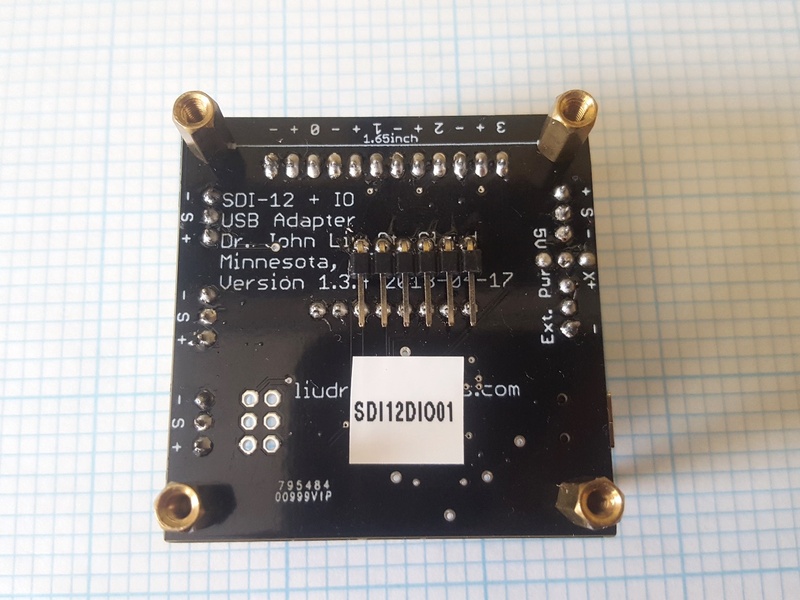 Do you wish to use the SDI-12 USB adapter with a programming language other than Python? Leave me a message here. I conducted a long run (5 months) on an SDI-12 sensor with a raspberry pi zero in the months of June to October to test the long-term stability of my data logging solution. I was using a regular SDI-12 USB adapter, a Decagon/METER Group soil sensor model 5TM with dielectric constant and temperature sensors and I buried it in my back yard. Over 100K data points later, the ground was freezing and I unearthed my sensor and stopped the feed. Here is an overview of the data feed. Please click the plot to see a full-size screen grab. The top plot is dielectric constant. Each spike represents a major rainfall in my area that made the electrical conductivity of the soil shoot up and then gradually die down. Each small step is when I turned on my sprinkler system to water my lawn (smaller than the spikes but still significant within a range of a few days). The bottom plot is ground temperature, about 20 cm in the soil. The diurnal temperature variation is greater during the summer than during the fall, as represented by the larger amplitude oscillations of temperature at the beginning of the graph and the gradual reduction of oscillation amplitudes towards the end of October. It is charged by a 12V ac adapter and provides 5V power on its USB port. When the ac power is out, it uses its internal battery to continue to provide 5V power. 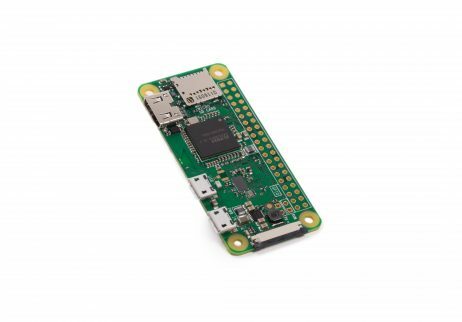 For a small system such as raspberry pi zero, it could power it for hours. It seems to work alright, although the fees have more than doubled from just the 2%-4% paypal fee for inmojo or my blog sales to 5% Tindie selling fee + 2%-4% paypal fee. I decided to not change the selling prices to compensate. Hopefully if you’re able to use inmojo market place or my sales links on my blog page, you will use them to help me save some fees and keep prices reasonable. 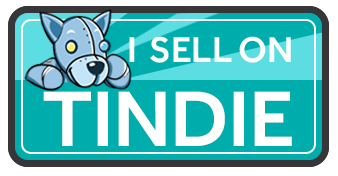 The tindie market place is global and has a fair amount of interesting gadgets for sale. I sometimes just browse the site looking for interesting products and inspirations from fellow makers. Check it out! Only 4 orders so far, a long way to build up the popularity that I have on inmojo. Select “Security” and set a personal password so you can always log on to your mom’s computer using the 9-digit number and this password as long as she has turned on her computer and has internet connection. Besides poking around the remote computer, you can send files back and forth, talk/text chat to the person on the other computer, do some screen share etc. There are lots of features that you might find useful. Besides, you can run this software on win/Linux/Mac and raspberry pi (Linux version is eval. and has no file transfer features as of the writing of this post). Over the past summer I have been designing my SDI-12 data logger. So finally I was ready to send my design out to JLCPCB.com for a small batch (10 boards). I thought, why not trying out their $7 stainless steel stencil for a change? I’ve used Kapton stencils for over four years and have grown tired of the floppy stencils and frequent need to clean under the stencil while stenciling the boards. 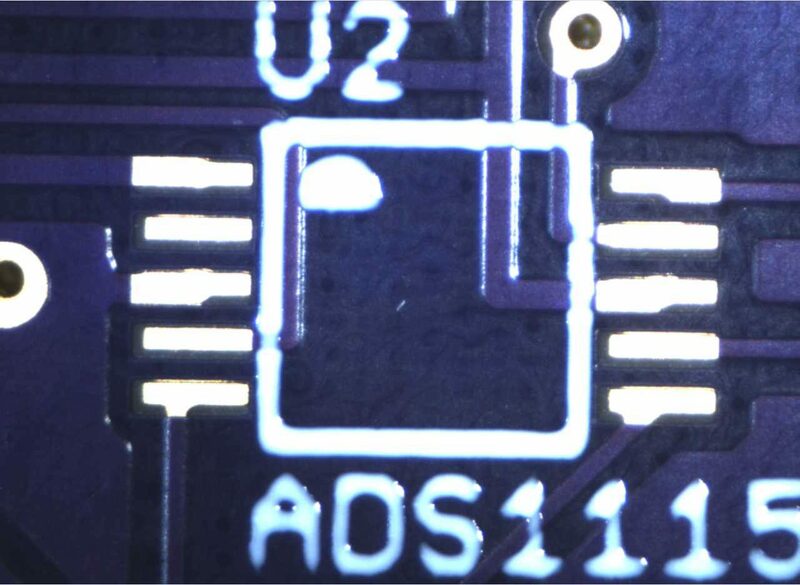 Bigger holes like crystals often leak solder paste under them and make the printing a bit messy. Overall leakage causes printing to degrade after a few board and you might have to wash it clean after a dozen boards if you can’t stand the degraded prints. Plus, alignment with Kapton stencils is not great since the film can be stretched very slightly to lose alignment across a slightly larger board (a few inches long). Since I reviewed the quality of a batch of printed circuit boards made by JLCPCB.com in comparison with a popular PCB service a while ago, they were pretty happy with the details I went into with my favorable review and promised to print another batch of boards for free. I took the offer and asked for a stainless steel stencil. So the following story is my first impression of stainless steel stencils, which is very positive after some minor struggle. Hope it is as entertaining as it is useful. The package has two wood/paper/cellulose boards that sandwich the “gigantic” stencil. The stencil is protected (on both sides) by a polymer film. 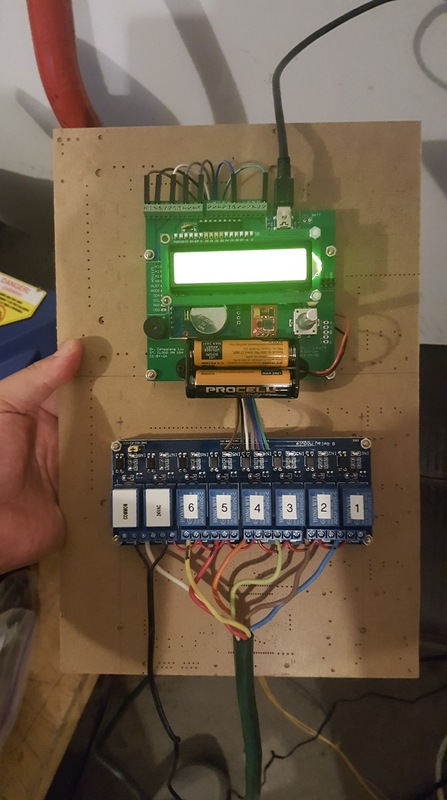 By the way, I used half of one of the cellulose board (probably a sacrificial base board for PCB routing) and built a home sprinkler controller on it. Details of that project will be forthcoming when I clear my backlog of “things to be posted”. Here are the PCBs (10-qty) and a ball pen with paper stem, very environmental! Wait a minute, let’s bend along the line to see if it breaks. LOL it won’t break! Back to scissors. I made the cut but the edge was not flat. I can’t use this on printed circuit boards! I won’t even use these as decent shims. I started looking for tools around my lab and office area. How about this paper cutter? I didn’t have a single solder bridge or spot that needs rework. A list of components I put on the board: ATMEGA328P-AU, ADS1115, ESP32, MicroSD card slot, DS3231, battery, crystal, LM1117-5.0, various 0805 resistors and capacitors, polyfuse, transistors (FET and BJT), and a number of thru-hole components. So the end result was pretty darn good, for $7 extra only! My Kapton stencils of smaller sizes cost more (including shipping). I would highly recommend this stencil service if you’re already considering getting PCB from them, JLCPCB.com.